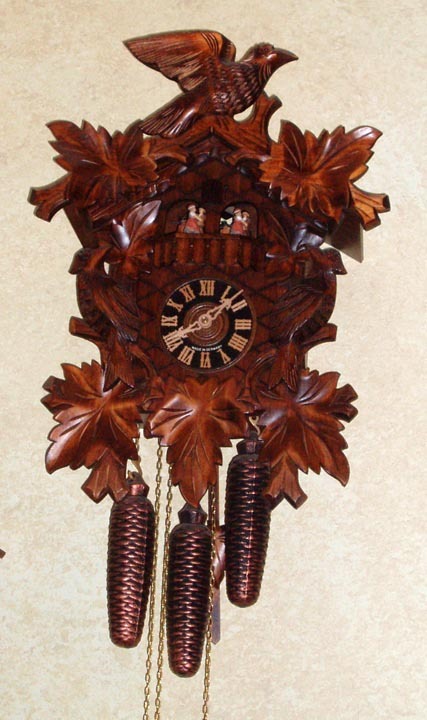 I love cuckoo clocks. 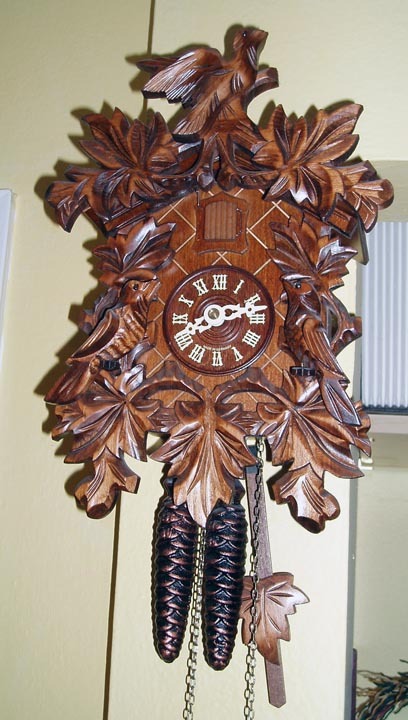 One of my most prized possessions is a cuckoo clock that I inherited from my great-grandmother, Anne Chambers. I remember it from when I was a little girl in Tennessee. 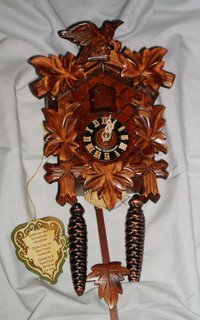 Whenever we would visit, my sisters and I would gather under the clock and countdown until the cuckoo appeared on the hour. Over the years, I've added a few clocks to my collection. One is an antique I found at a flea market; it doesn't keep time, but probably could with a little work and a little luck finding spare parts. 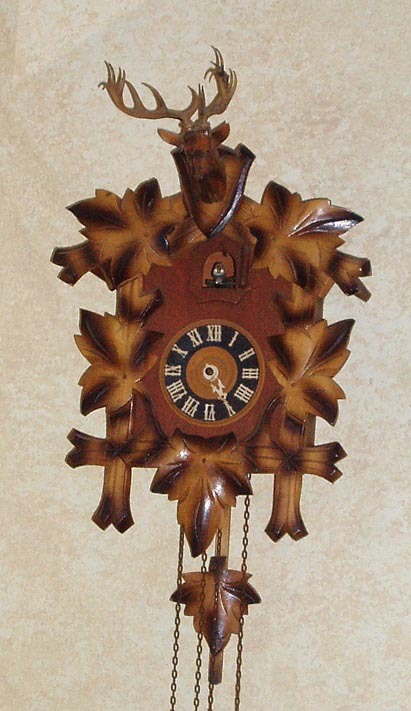 Two other cuckoo clocks were purchased at a shop in Solvang that has an entire wall of cuckoos. I love going in and listening to the ticking, the different bird calls, and the variety of tunes. It's a real struggle not to buy another clock every time I'm there. The majority of my cuckoos are one-day clocks; they have to be wound every day. This is my only seven-day, and my only musical clock. It plays two different tunes, one for a.m. and the second for p.m. Pretty clever, huh? Remember Kevin, the guy that took over my job when I retired? (Everybody wave to Kevin.) Kevin just got back from a three week trip to Germany, where he has family. Before he left, he asked if I'd like him to bring me anything. (I think he asked everybody in the office. I heard he brought back two very large bags of really good chocolate to distribute.) So, what did I ask for? Need you ask? 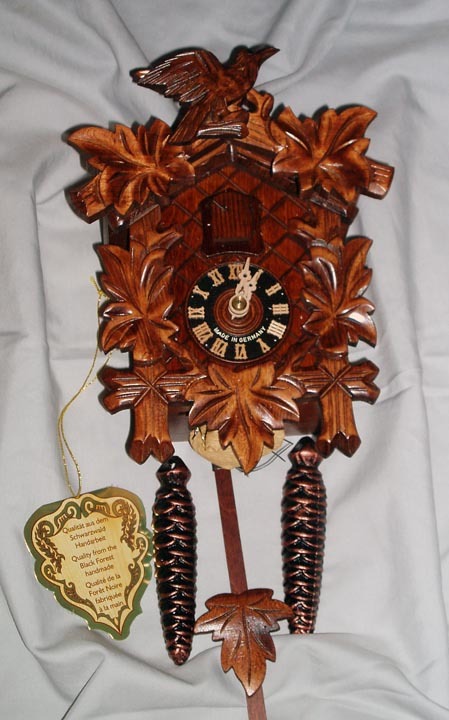 Here's my newest cuckoo clock, straight from Germany's Black Forest. It's gorgeous! I plan to hang it in a place of honor in my new studio. Thanks, Kevin! It's beautiful. They all are. You have quite a collection. I don't think I've seen all of those. Mine came with that same tag and it also said it came from the Black Forest. Very cool.